A new test can show how much a zebrafish larva has eaten. This basic information could be crucial to upcoming discoveries. A zebrafish swims in its tank. 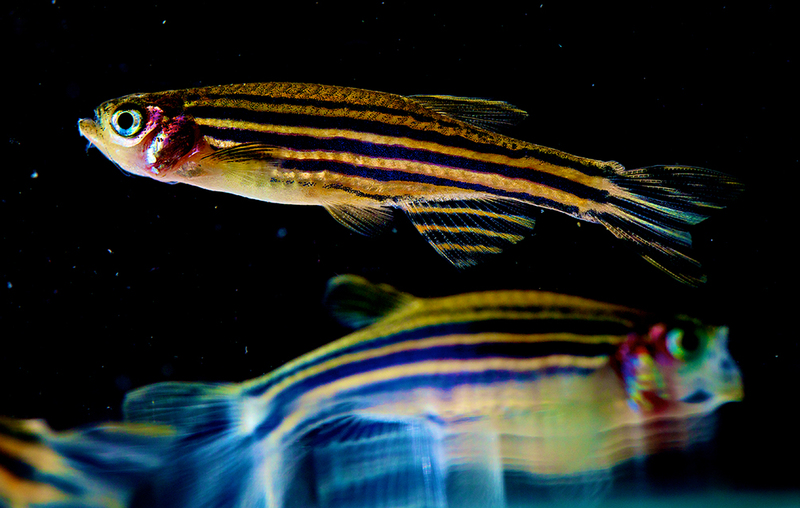 Understanding how zebrafish move can give researchers insight into how certain diseases impact human motion. Photo courtesy National Institute of Child Health and Human Development. Until now, it was hard to know when a zebrafish larva had a full stomach. Researchers in Anand Chandrasekhar’s Lab at the Bond Life Sciences Center are studying the networks of neurons that control the zebrafish’s jaw, but to do that, they first had to figure out just how much these fish larvae eat. They didn’t just need to understand it, they had to be able to test it. The successful development of a test that measures how well a zebrafish larva can eat has already lead to more discoveries. To develop this test, researchers fed the larvae fluorescent fish food for three hours at a time. That’s just long enough for them to eat it, and just before their intestine starts to push it out. Their tiny, fluorescent bellies were examined under a microscope and scored. A zero meant that there was no food in the larva’s stomach, while a three meant the stomach was completely full. With this feeding test under their belts, researchers are now able to form and test more research questions. The Chandrasekhar Lab used it to better understand networks of branchiomotor neurons, the circuitry that controls jaw movement. These neurons also control the gill muscles that move in automatic movements, such as breathing, just as neurons in the human brainstem allow us to breathe without thinking. Researchers look at the zebrafish’s very basic motor neurons to understand how these nerves develop, heal and control simple tasks. One experiment tested how fewer branchiomotor neurons affect the action of eating. They destroyed 50-80 percent of the larvae’s branchiomotor neurons using a chemical-genetic method. The fish with fewer branchiomotor neurons also ate less food. They tried a similar experiment, but this time using lasers to remove only a select portion of branchiomotor neurons that controls a set of jaw muscles. Again, they found that the larvae that went under the laser were not able to eat as much food as the normal larvae. Finally, they conducted the food-intake test with mutant larvae that did not have any cranial motor neurons. As the researchers predicted, the mutants were not able to eat. Now, they want to test how these animals eat when these neurons develop differently. While the first tests essentially smashed nearly all of the zebrafish’s branchiomotor neuron circuitry, their upcoming research will examine what happens when these circuits are wired in a different way, with neurons in the wrong spots. They’ll be looking at much subtler changes, Chandrasekhar said. Asante is also working to make the feeding test more quantitative and less labor intensive. In its current form, someone has to look at each larva and judge if the food in its stomach makes it a zero, one, two or three. They want to be able to measure more accurately how much food is in the fish’s belly. If they were able to develop a faster and more accurate test, researchers would be able to rapidly measure food intake in a greater number of fish and to test the effects of many different chemical and environmental factors. Zebrafish are a unique lab animal model used in research for a number of reasons. They’re easy to observe because the embryo develops quickly in an egg outside of the mother. They’re transparent, so researchers can make certain cells visible using florescence and observe them in a developing animal without killing it. Their genome is fully sequenced, so researchers can easily create mutations in specific genes using CRISPR technology. Research into the zebrafish’s neural networks can help researchers understand diseases like Amyotrophic Lateral Sclerosis, better known as Lou Gehrig’s disease, which causes a loss of function in a human’s motor abilities, including those of the branchiomotor neurons. This study “Role of branchiomotor neurons in controlling food intake of zebrafish larvae” was recently published in the Journal of Neurogenetics.